In this final post in this series on inverses we consider the graphical and numerical concepts related to the derivative of the inverse and look at an important formula. Great formula, but one I’ve never been able to memorize and use correctly! It’s my least favorite formula, because I’m never quite sure what to substitute for what. 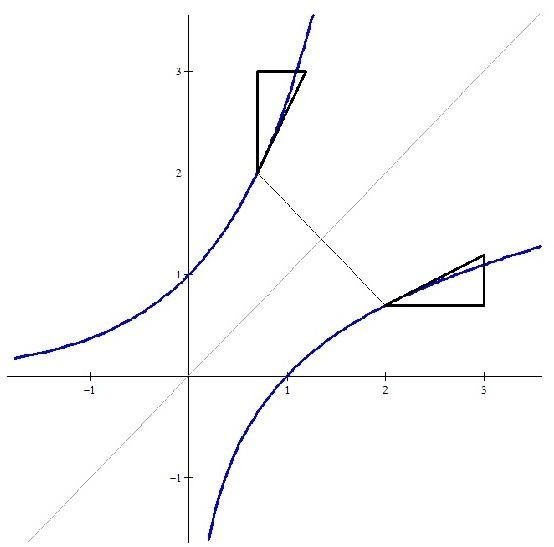 The graph shows a function and its inverse. It really doesn’t matter which is which, since inverse functions come in pairs: the inverse of the inverse is the original function. Notice that the graphs are symmetric to y = x. At two points, one of which is the image of the other after reflecting over the line y = x, a tangent segment has been drawn. This segment is the hypotenuse of the “slope triangle” which is also drawn. The ratio of the vertical side of this triangle to the horizontal side is the slope (i.e. the derivative) of the tangent line. The two triangles are congruent, so that the horizontal side of one triangle is congruent to the vertical side of the other, and vice versa. Thus the slope (the derivative) of the one tangent segment is the reciprocal of the other. If (a, b) is a point on a function and the derivative at this point is , then the point (b, a) is on the function’s inverse and the derivative here is . This is just what my least favorite formula says: if f -1 (x) = g(x), then a = g(b) and . At corresponding points on a function and its inverse, the derivatives are reciprocals of each other. This is what my least favorite formula says. Given that and g is the inverse of f, Find . The solution is reasoned this way: (5, ?) is a point on g. The corresponding point on f is (?, 5) = (2, 5). The derivative of f at this point is 3, therefore the derivative at (5, 2) on g is . 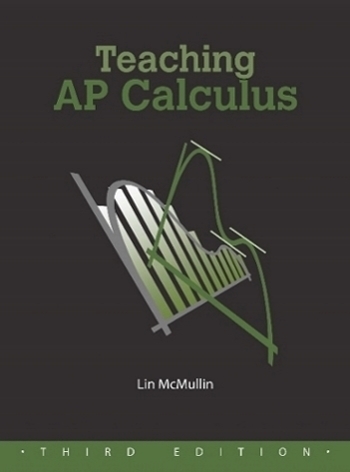 The formula ( as well as the formula in the general inverse/implicit function theorem ) is confusing because the formula involves the dependent variable instead of just the independent variable as is the case of most calculus formulas that students have seen. If the direct function is regarded as “known” the formula gives you a differential equation satisfied by the inverse function. As Matt indicated multi-branched inverses add to the potential confusion when using the formula. Conditioned reflex usuage of this formula can be dangerous. One needs to understand it. Just browsing the net and came across this. A nice geometric explanation of the very important inverse function theorem, but you don’t need the congruent triangles argument. If the function and its inverse are symmetric around y=x then so are their tangent lines. So if $y = mx+b$ is an arbitrary tangent line on f, then x = my + b is the tangent line on the inverse, which has a slope of (1/m). But there’s a danger in this because it only works generally for functions which are monotone, and hence have a full inverse. For functions with different branches, it doesn’t hold (which is the point of the inverse function theorem). You have to carefully consider the proper branch. For instance, sin(pi) = 0 and sin'(pi) = cos(pi) = -1 One would expect given the “formula” that arcsin'(0) = -1. But in fact the derivative of the arcsin(x) at x=0 is 1. The purely geometric argument failed because flipping a perfectly good function like sin(x) around the y=x line, creates a graph which is no longer a function except on a restricted domain. This has always been my least favorite formula too. Every year I tell my students I cannot memorize that darned thing! When they ask for it, I mentally go through the graphical process to “derive” the formula (no pun intended).